Keith Olbermann is opposed to biased graphics. In related news, Donald Trump condemns publicity seekers. But our winner, Sean Hannity over at Fox Noise, well, the production team behind his solo show, which night before last used this graphic: "Democrats are legislating defeat in Iraq." Not even a question mark, just stated as fact with his channel's brand name next to it, a brand name that for some inexplicable reason contains the word news. Just how irresponsible is that? Well, what if another network ran a graphic reading say, "Fox News enabling American deaths in Iraq." How does that work for you? But if you think we're going to criticize MSNBC or its crack staff of chryon operators for this, you're wrong. This bit is clearly commentary and opinion (just like Hannity's "State of America" segment) and we have no problem with such views being illustrated on screen. Even with the channel's brand name next to it. So we're not going to ask "just how irresponsible is that?" Not yet. 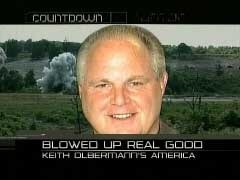 However, it might be interesting to look at the graphics Mr Olbermann uses in other parts of his show, a program described as a "newscast" hosted by an anchor who claims he is "not politically biased". Say, for example, an image of a gunshot that just happens to hit the head of Rush Limbaugh? Those horrible Fox graphics. They are so unfair and partisan. 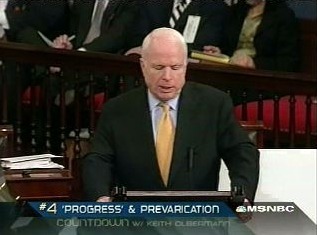 Oh and by the way, John McCain is a liar. Not even a question mark, just stated as fact, with MSNBC's brand name next to it. Just how irresponsible is that? 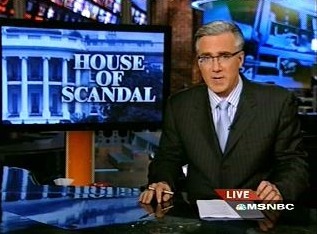 In comparison to what Olbermann pointed out, they're identical. Fox is biased, period. There are no liberal editorial programs on Fox. You will never read graphics on Fox News stating "Conservatives out of touch with America" "Republicans legislating hate against homosexuals". It's pure propaganda, and you know it, and that's why you can't even convince your fellow conservatives like Jonah Goldberg that Fox is fair. If you can't convince a partisan like Goldberg, you've hit rock bottom. Face it, everyone knows you're full of shi-t.
By the way, Johnny, they took out a poll. Turns out, 88% of Fox's audience supported Dubya in the 2004 election. "They" took a poll? You mean a Democrat PR flack took somebody else's numbers (he didn't conduct anything, he took tv ratings from AC Nielsen!) and juggled them around to come up with what he wanted? And you call that "they took a poll"? According to a study by Mediamark Research, only 38 percent of Fox News viewers self-identified as conservative. In terms of sheer numbers, that means the non-conservative audience for Fox tops CNNs TOTAL viewership. Ya know Johnny I was going to say after reading how 'inside cable news' busted keith for using a ten and a half year old clip for this years keithie whatever winner. Well, Zombie Nation won't even be able to defend him on this one. Who is going to believe a ten and a half year old clip was made this year. But then I remembered, Tom posts here.